McCourt has been a leader in the construction industry since 1893 when Irish Immigrant John McCourt left his job as a foreman for Boston Gas and launched his own business as a utility contractor. Four generations later the company has evolved into a comprehensive General Contractor with experience in virtually all facets of the heavy/civil construction industry. John McCourt emigrates from County Tyrone, Ireland to Boston, MA and takes a job with Boston Gas – eventually working his way up to foreman. 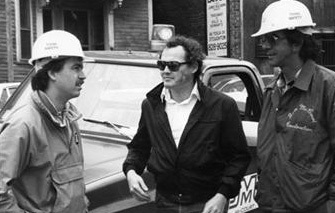 John leaves Boston Gas to launch his own company and “The John McCourt Company” is born as a small utility contractor. John McCourt passes away. His wife Sabrina takes over day-to-day operations of the business, making her undoubtedly one of the first females to lead a construction company in the United States. The second generation takes the reins as John and Sabrina’s three sons Francis, Tom and John Jr. take control. McCourt Construction diversifies, opening an asphalt plant in Lechmere Square in Cambridge. Attending Georgetown on a football scholarship, Francis’ son Frank receives a bachelor’s degree from the university in 1938. He is the first McCourt to graduate college. During WWII, the company diversifies into airport work, building runways in Massachusetts, New Hampshire and Connecticut. Cousins Frank and Jack return from WWII and take the reins at McCourt Construction, now in its third generation. Frank’s oldest son Richard joins McCourt full-time upon graduation from Boston College. McCourt Construction is now in its fourth generation. McCourt Construction becomes one of the largest installers of coaxial cable in the country, installing the cable television infrastructure for cities including Boston, Brookline Sacramento and Palo Alto. McCourt uses a unique technique that comes to be known within the industry as McCourt Boston Integral (MBI) to reduce time and costs. McCourt goes international, launching a joint venture in England and building Grenada’s first independent TV station. McCourt begins a $300 million urban tunnel joint-venture. McCourt Construction is named “Contractor of the Year” by Massport (the Authority that runs Logan Airport) in the first year the award is given. Granite Links, an award winning 27-hole golf course is named “Top Ten Best New Upscale Golf Course in the Country” by Golf Magazine. McCourt, a minority partner in the project, built the golf course over landfills and quarries using fill from Boston’s Big Dig. In November, Runway 14-32 officially opens to air traffic at Logan International Airport. McCourt delivered the runway ahead of schedule and under budget. This is Logan’s first new runway in more than 40 years and continues McCourt’s tradition of having built or rebuilt every runway and taxiway at the airport. 2006 is the 60th straight year McCourt has performed work at Logan! McCourt Construction is again named “Contractor of the Year.” This marks the sixth time in its first seven years of existence that the award has been presented to McCourt. McCourt is the low bidder on a $50M project to widen Interstate 93. McCourt is the low bidder on an $80M project to widen Interstate 95. Happy Birthday! McCourt Construction turns 120! On January 21st, Walsh-McCourt (a joint-venture) is chosen to replace the Whittier Bridge over the Merrimack River in a $295M design-build project. McCourt has 12 miles of highway widening and 18 bridges in various stages of construction throughout Massachusetts. McCourt Construction completes the reconstruction of the Callahan Tunnel under Boston Harbor. This high-profile project necessitated 24-hour, 7-day a week schedule. The project had large financial penalties for a late reopening, but McCourt opened the tunnel four days early. In 68 days McCourt’s laborers alone (not including subcontractors) racked up over 40,000 man-hours. 2014 McCourt lands the $34M Silver Line Extension project. This rapid transit project extends the Silver Line from Logan Airport into Chelsea, MA and includes four new stations.